Barn World, your best source for equine tack, is proud to offer the best quality saddle pads and cinches available. 5 Star saddle pads and cinches are hand made to order and offer French Contouring to ensure a proper fit for your horse or mule. The unique saddle pad design allows it to conform to your horse’s back and provide the best fit for equine performance and comfort. We are so impressed with the 100% wool saddle pads and simplicity of design, that we believe everyone could benefit from using them. If the saddles don’t fit they can push pads out the back. A saddle tree may be warped if it pushes pad out the back and to the side. If you wouldn’t wear that stuff for underpants or socks why put it on the animal! Synthetic pads have the highest profit margin for makers. Sweat pouring off a back is like you standing on ice with tennis shoes on a hill! Do you like having bandages pulled off your hairy arms? So how do you think tacky material feels to an animal? Wool felt pads are easily cleaned! Synthetic fleeced saddle skirting is slick and will present problems with most pads. Don’t be fooled by Patent Pending in advertising. Synthetic foams break down from heat and salts of the animal. Fire or strong acids are the only thing that will harm wool. All pads will contract and spread disease when not cleaned if infection exists. Pinch pads with thumb and fingers. If you can feel the other digit it likely has bad compression protection. Buy for function first, then looks. Don’t be fooled by gimmick terms and pictures. Ask construction specifications of retailer and manufacturer. For all of your equine tack needs, please visit BarnWorld.com today or call 720.238.2190. Barn World carries a large selection of saddle pads 5 Star equine as well as cinches and breast collars. We also have sheepskin saddle pads and covers for horse tack protection and equine style. All of the cinches and breast collars we offer are made from 100% mohair and provide the maximum amount of comfort, performance and durability. Our wool saddle pad selection is made from more virgin wool than any other 100% wool pad. This allows for 3 times the compression protection than synthetic neoprene pads and gives more even weight distribution and impact absorption. These 100% wool pads offer 4 times the wicking ability to eliminate moisture and heat buildup to provide riding comfort and protection for both horse and rider. It it also allows for soft and durable easy cleanup. Saddle pads come in a variety of shapes and sizes and each has a specific use or function. Selecting the right equipment will ensure that both you and your horse or pony will be comfortable and prepared to work. Contoured or shaped pads – made of fleece or sheep skin, these pads are cut to the saddle shape and are used for horse showing and Hunter and equitaion classes. 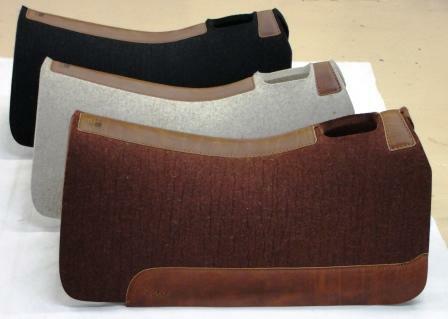 Square pads – are popular for dressage, and are permissible for jumpers and cross-country. Examples of these pads include aroma pad, an ideal choice for everyday riding. This is an all-purpose pad used with both saddles and can be used in competition. Baby pad – a lightweight every day schooling pad often used in conjunction with corrective pads. Corrective pads – typically used in addition to another saddle pad. Gel pad – reduces impact and shock to the horses back providing a cushion between saddle pad and horse. Riser pad – creates added lift for the back of the saddle. Half pad – provides protective cushioning, impact absorption and uniform weight distribution of the saddle. Cashel pad – relieves pressure points on the horses back and withers. Wither pad – provides back protection by relieving pressure on the spine. Saddle Pad Overview Video: There are a lot of different saddle pad types available! Saddle Pad Construction Video from 5 Star – a Barn World favorite! In the last 20 years the industry has come up with using every conceivable kind of thing out of the auto industry and space industry that was never intended for use in horses. Everything from gels to foams to freezer linings all of these have zero or next to nothing as far as good quality and compression protection and absolutely zero in wicking ability and the agents that are needed for wicking sweat and heat away from the horses back. Pressed industrial felt is the only thing that has really been proven over time to have the high quality wicking ability and high compression ratio for horses. 5 Star has 3 times the compression ratio of any other pad on the market and has 2 times the wicking ability of any close competitor in the felt industry as far as pads are concerned. So why is 5 Star so good? 5 Star uses the highest quality virgin wool content in their felt. Only through the use of high-quality virgin wool, can you have a high-quality compression ratios and the high wicking quality you can get. Add to that,5 Stars established French curve that will fit any horse backline that settles in to create high-quality performance. 5 Star is a pad that will last forever, kind of like an old sweater that you snag and you throw away so that you have a chance to get a new one. Nothing makes it simpler for performance and making 5 Star the best pad in your tack room. Remember to visit Barn World for all of your saddle pad and equestrian supply needs. We carry a full line of cinches, breast collars and even sheepskin pads for all of your riding fund. Barn World carries the highest quality saddle pads available. All of the equine pads we offered are one-hundred percent wool and are uniquely designed to ensure they provide the best in saddle pad performance and comfort for both you and your equine partner. Check out this video from the owner of 5 Star detailing how much quality goes into a 5 Star saddle pad and why it is so much better than the competition’s and remember to visit www.BarnWorld.com for all your livestock supply needs. A lot of gimmicks can be strapped under a saddle to get one benefit or another, but man has yet to create a product that outperforms virgin wool, and over the long haul, virgin wool content felt pads will outperform any other type of pad or blanket hands down. 5 stars 100% percent wool contoured saddle pads conform immediately to your horse’s back for perfect fit. Our F-11 wool felt has the highest virgin wool content available and offers 3 times more compression protection and wicking ability than any other pad on the market. While the importance of compression protection is pretty clear given the dominance of rubber, bubble wrap and space age jelly saddle pads today, only high quality wool felt offers great compression protection while simultaneously wicking away moisture. That wicking action is the means by which heat is dissipated under the pressure of the saddle. The best compression protection, coupled with the best wicking ability, translates to the best performance from your equine partner. When you consider the amount of money one might spend on feed, tack, vet bills and entry fees to pursue your equine passion, a saddle pad with all the ingredients for maximum performance is essential. While the big ships full of cheap goods leave a toxic trail all the way from Los Angeles to China and back, 5 Star is producing the highest quality products right here in the USA.